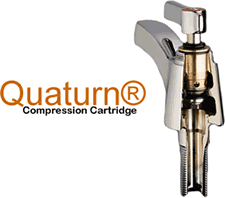 Chicago Faucets offers a complete selection of commercial-grade cartridges including the Quaturn®. Truly an American original design - it is a solid piece of engineering that has set the standard for commercial faucets for the past century. A cartridge is the heart of any faucet. It regulates the flow of water and is the single most important component that effects overall performance. While there are imitations, there is no substitute for the quality of a Chicago Faucet cartridge. The Chicago Faucet cartridge collection includes more than 100 types of cartridges designed for your application needs: Quaturn, Ceramic, Slow Compression, Metering and Klo-Self self-closing cartridges.